Elizabeth St. Hilaire joins us for another paper collage workshop in 2018 and we couldn’t be more excited to have her back! This year’s workshop, from June 24-30, 2018, will focus specifically on crafting animal portraits. In advance of her workshop, Elizabeth took a moment to answer a few questions for us! ESH: I have a BFA from Syracuse University, I have always been a full-time working artist, starting off in Graphic Design and ultimately making the transition to full time painter and workshop instructor. ESH: I have two easels in my studio and i work on multiple pieces at a time depending on my deadlines. I often paint in a series, so that determining “what’s next” is a little easier. I have one easel that holds larger, oversized work, and one that is set up for smaller work. ESH: I have a variety of successful subject matter that I rotate in and out of according to what’s of interest to me at that time. ESH: It’s how I pay my bills 🙂 And it’s my true love, my happy place, my comfort, my joy, myself. ESH: Deciding to give up the commercial life of graphic design in order to be a full-time fine artist. 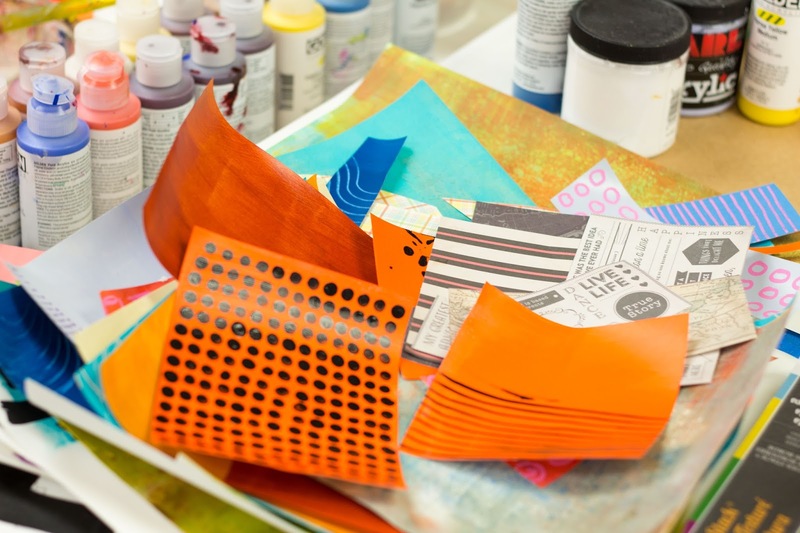 Learn more about Elizabeth’s Paper Collage workshop here. Find out more about Laurie on her website and give her a follow on Facebook, Pinterest, & YouTube. We’ve officially finished off our painting workshop for the seasons and we couldn’t have ended it with a more exciting workshop! 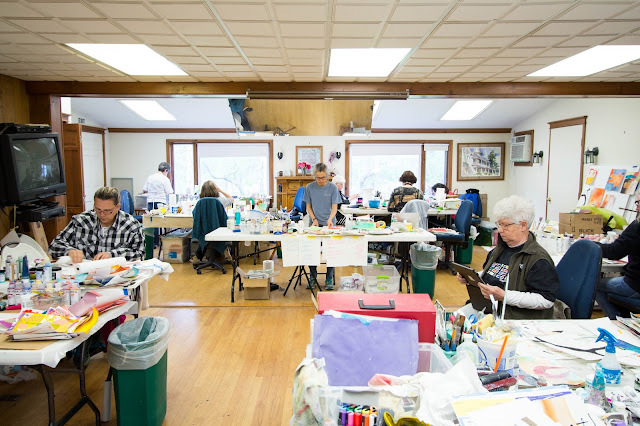 Fran Skiles and seventeen students spent the week crafting mixed media paper collage pieces including all sorts of varieties of paper, fiber, paint, thread, and more. As always, we’ll share a few of the images we captured here on our blog, but encourage you to also check out the full gallery on our Facebook page. You can also scroll back in our Instagram feed to see what we captured during the class. And of course, our video for the week, found on our YouTube channel! “I loved the convenience of working on our art about any time. I learned a lot from Elizabeth and enjoyed her teaching style – informative, creative, open-minded, joyful, laid back, approachable. Loved her art, technique, & style!” – Jody B. 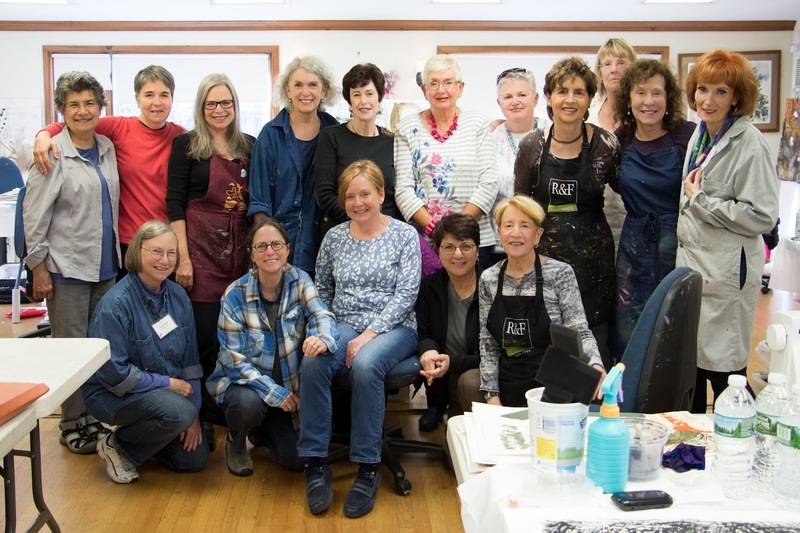 What a fun week we all had with Elizabeth St Hilaire here to teach her Paper Painting workshop. Lots of ripping and tearing going on, as well is lots of painting, stamping, printing, and splattering. The workshop began with a slew of techniques for creating unique painted papers to use as the palette of colors for paper paintings. Jody came all the way from Colorado to take the workshop with her daughter, Molly. Jody is a cattle rancher, as you might guess from her subject matter! The perfect Fall weather made the back lawns of the inn a great place to take a break and stretch you legs. Pumpkin pancakes are back for the Fall as one of the daily specials for breakfast during the week. If you missed your chance at coming to this years workshop, Elizabeth will be back again in June of 2018! It was a joyful week with a misty-eyed ending. Karen Rosasco was here to teach her last workshop on the road. Karen taught her first workshop with us in 2007 and has taught every year since 2009. 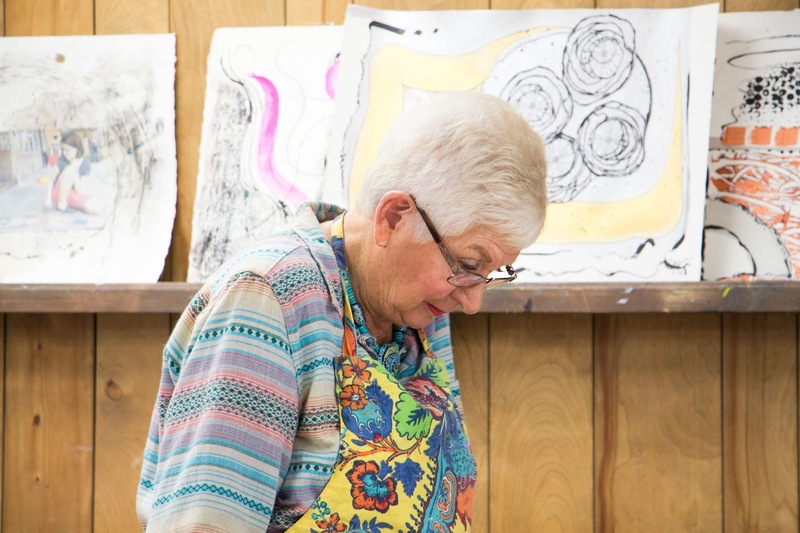 Karen has been coming to the Hudson River Valley Art Workshops as a student since the early 1980s! So it was definitely with misty eyes we bid farewell to Karen on the last day of the workshop. Karen, formerly of New York, is now making her home in Virginia and will still be teaching but only locally to her home and also private lessons out of her home studio. You can learn more about this on Karen’s website. 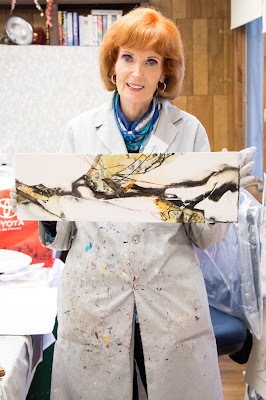 Enjoy this glimpse into the activity and creativity of the 5 days of Karen’s workshop. This is the Chili Verde that was served one of the nights as the alternative dish for the vegetarians. Many requested the recipe, so I’ve added it to our recipes page. The grounds of the inn are looking lovely and the weather was beautiful all week, making the lawns a perfect place for spreading out painting to dry or when experimenting with a particular messing technique! 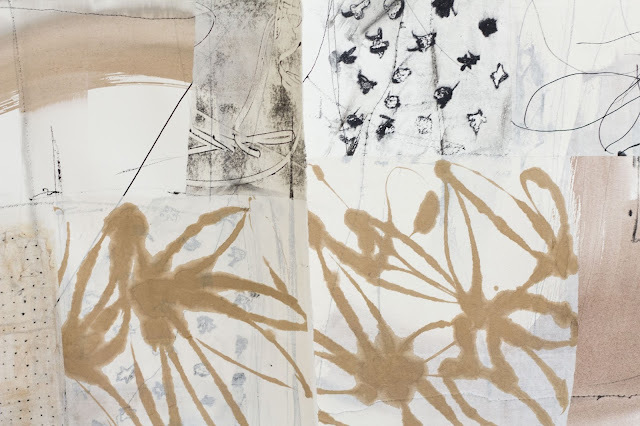 Elizabeth Busch is an artist who draws, paints, sews, and sculpts space. From her workshop in Maine, Elizabeth works in two mediums: Kinetic Sculpture and Art Quilts. Elizabeth Busch will teach a five day Workshop, The Painted Quilt: Creating Small Works at the Hudson River Valley Fiber Arts Workshops October 30 to November 5, 2016. Elizabeth recently explained her philosophy of art, and teaching. My first workshop was in 1987. The director of the Fiber Department at the Fredricton New Brunswick, Canada, School of Art saw an article about me and my Painted wall quilts in a then new magazine called Threads. She contacted me and asked if I would be interested in teaching a workshop to her fiber majors. I replied: “I’ve never done such a thing…what would I teach?” She said, “How about what you DO?” … and the rest, as they say, is history. There is nothing quite so thrilling as seeing a ‘lightbulb’ go off for a student. I so enjoy meeting new and former class participants, sharing ideas and problem solving with everyone, using my favorite tools and processes. I absolutely love to teach, to watch others learn and grow in such a short period of time! Problem solving with several other people, seeing different results that materialize for everyone, and letting that ‘door open!’ I teach exactly what I do in my own work: it is fun, simple, and freeing. If you liked Kindergarten, I think you’ll like my workshops! I recently finished a large scale Public Art commission for the Maine State Library, Museum and Archives at the state capitol in Augusta, ME. I have supported myself as an artist since 1987, and the major portion of that income is from such commissions. Most of those commissions are my Kinetic Sculpture. I generally teach 4-6 workshops per year and in between do my ‘soul work,’ my own Art Quilts. I am so fortunate to have a balance between my major source of income (Public Art Commissions); teaching workshops (in which I get to travel, meet wonderful people, and share my processes with them), and creating my own Art Quilts. No. I do not have gallery representation. I did years ago, but find that teaching workshops, creating public art commissions, and exhibiting in shows feeds all of my financial and soul’s needs. I have lived for 40 years in an 1856 Maine farmhouse, complete with attached barn and shed. 40 years ago there were chickens, ducks, a horse and a ‘beef critter’ in the barn. My two children, husband and I ‘lived off the land…’ kind of, but not totally. Now, the children are grown and gone, I’ve been divorced for 20 years, and the barn and shed are my glorious studios! I do share the barn studio with an occasional friendly little mole who skitters across the floor when I least expect it. Name five of your “can’t do without” tools/products. Five can’t do without…unsized cotton duck, Textile paints, my Bernina 960, hand needles and embroidery floss, big work walls…and lots of good lighting! ” BEST CLASS EVER! !” “Absolutely met my expectations. Tremendously good instruction. Congenial and interesting group. Great workspace and environment.” – Barbara B. It was a great week with David Daniels as he taught his popular watercolor workshop to a full house. The class had a canine mascot, Cloe, who came with one of the students. She was a very sweet dog. Cloe like to “offer” the opportunity to give her a belly rub every chance she got, plopping herself on the floor and presenting her belly. Here is a behind the scenes shot of chef Mark and Nancy rolling out dough for the Chinese soup dumplings that are being served this year. They are made and steam right be for service, so they come out hot and fresh to the table. 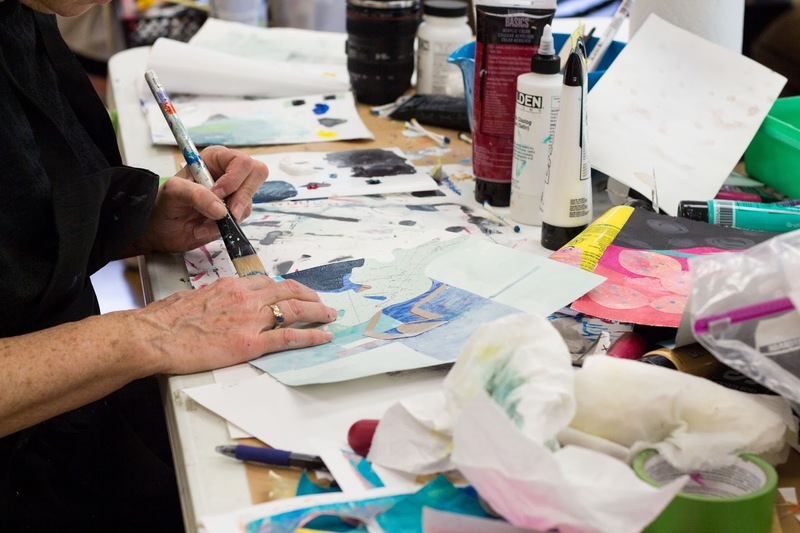 If you were on the wait list for this class or are now thoroughly intrigued about taking a workshop with David Daniels, as luck would have it David is stepping into to teach a combined watermedia collage and watercolor workshop in just a few weeks. This is sure to be a fun and informative workshop that you don’t want to miss. Karen’s class took over the parking lot one day to get messy with charcoal and water! There were a lot of interesting starts and finishes in this class! This is a bird house painted by Peggy Pepmiller, one of Karen’s students (and our retreat regular!) We gave her an unadorned bird house last year at the retreat so that she could take it home to decorate. We plan to have a painted bird house topping each “post” of our flowering fence by the pool. This is Cristina Del Sol with a beautiful painting she started in Karen’s workshop last year and then finished at home. The happy crew all together! Most of them have already signed up for Karen’s class with us next year. It will be the last class that Karen teaches for us because she is semi-retiring and will teach only private lessons out of her home in North Carolina. This is the first in a new series of Interviews. Every artist was once an amateur. — Ralph Waldo Emerson. We’ve decided to share the inspiring voices and views of the very talented group of people who attend our Workshops. Some students are novices, attending a Workshop for the first time, exploring an interest in the creative side of life. Many more, however, are in various stages of professional development, and take Workshops to expand their range of proficiency, try a brand new medium, or return to a technique once learned but not recently practiced. Interestingly, our inaugural student interview is with someone who falls into both categories – once a slightly nervous student, Manon Boisvert has now attended a wide range of Workshops, fearlessly experimenting in media and techniques ranging from painting and digital printing, to fiber arts. The result has been rewarding both personally and professionally – Manon has been showing and selling her artwork in galleries in Quebec, and has developed a unique line of custom-printed silkwork cards. We’re pleased to share some of her story with you. How long have you been taking Art Workshops and what got you started? My first workshop was in 2002 with Arleta Pech in Vancouver. I realised that I could learn much more when I was with others watching an instructor demonstrate a technique or discussing an art topic. What is your favorite part of attending a Workshop? What I enjoy most about Workshops is the opportunity to explore new ideas with artists whose training is unique and different from my own. In their company, I find inspiration and it rejuvenates my artistic vision. What would you tell prospective students are the three best reasons for taking a Workshop? Taking a workshop is a brainstorming journey; each one is a valuable reference for every painting you begin. Each time, I am encouraged to awaken my sense of adventure and to jump-start my courage. What are you currently working on in your own art? I am learning about sewing machines (of which I knew very little), dry felting, digital printing, joomchi. I am experimenting with stitch marks and textures to complement my collage and painting creative process. I am a member of local, national and international associations. I exhibit my work in group shows and every two or three years I try to organize a solo. I have a “cave” studio where everyone is welcome. On my website, www.manonboisvert.com, you can find the calendar of events. When I have worked with galleries, I always enjoy bringing my husband with me! He does a better job talking up my talent. Most of the places where I exhibit have an online presence. My studio is in my hide-away. It feels cave-like, but with good lighting. Being organised is very important to me so I keep my space very clean, orderly and attractive. I also have several work stations where I can print, paint or read. I can’t do without the Internet; it is a lifeline to the universe of information; my Epson printer; a large, deep sink with running water; a library full of art books of all kinds; an ergonomic chair to sit at the computer, so that I don’t get neck or shoulder pain, and colour-balanced lighting. 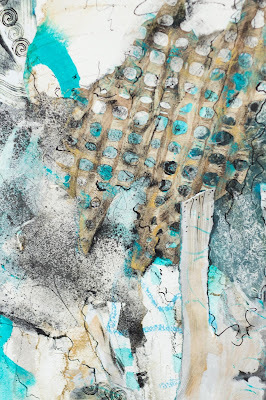 Meticulously torn bits of hand-painted papers, delicately put together, form the exceptionally vibrant collages created by Artist Elizabeth St. Hilaire Nelson. My eye was caught not just by the glowing jewel tones in much of her work, but by the expression, feeling, and mood captured in the images. They are sure to make you smile. Elizabeth St. Hilaire Nelson, born and raised in New England, has lived in Central Florida for the past 17 years. She holds a B.F.A. in advertising design from Syracuse University, in Syracuse, New York. St. Hilaire Nelson is a Signature Member of the National Collage Society and the Atlanta Collage Society. Elizabeth has recently been published in the Cloth Paper Scissors Book – Techniques and Inspiration for Creating Mixed-Media Art. Elizabeth had these responses to our interview questions. 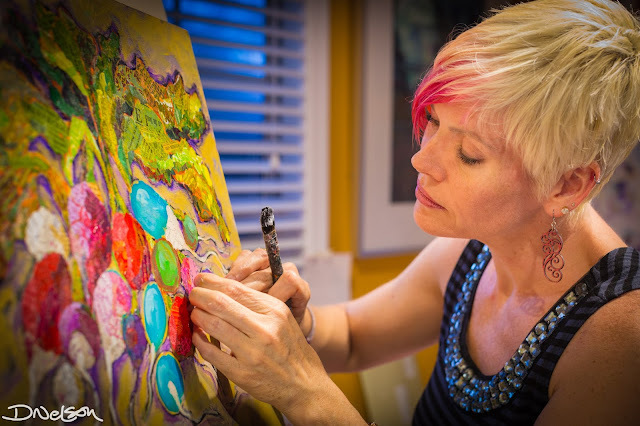 I started teaching six years ago because i was asked to be the very first workshop teacher by a start-up group called Amelia Island Artists Workshops, they were in business three years and I returned to teach with them every year they were. It was an opportunity I couldn’t resist. My favorite part about teaching is traveling to new places and getting to meet new people. Three best reasons are hands-on instruction, being immersed with other artists who have your goals and interests in common, and spending a weekend focusing on art. This is a treat most of us do not get in our day-to-day lives! I am currently working on a 60×30 piece with parts extending beyond the substrate. It’s a new venture for me, taking collage to a more 3-D level. This piece will be part of my private collection but I plan to offer the top-out effect in my new work for galleries. Yes it is, my best advice is to be persistent and do not give up trying. Getting into a gallery is very challenging, you cannot take rejection of your work personally. Keep applying and keep working at it. If people inquire to me directly about a piece on my website, I will track it down and offer it. I also take commissions and have had many requests to do so from my Facebook fan base. My studio is 10×12, built on a slab that was once a tool shed. It’s quaint, decorated on the outside to match my house. On the inside it has everything I need to make art, be creative, be inspired. Your chance to meet Elizabeth St Hilaire Nelson is coming soon! She will be teaching a 3-day workshop for us on May 30 – June 1, 2014. There are still some spots available in this exciting workshop. Catch the latest from Elizabeth on her blog – Paper Paintings. The weather has turned mild and the grounds of the Greenville Arms 1889 Inn, home of the workshops, is busting out all over with buds and flowering bulbs. The stage is being set for some fun workshops in May with Barbara Nechis, Mary Alice Braukman, Eric Weigardt, Robert Burridge, and Paul George. Robert Burridge’s class is full and Barbara Nechis’ class has only a couple of spots left, but the others still have a bit more space. Mary Alice Braukman is once again teaching a 5-day workshop, May 6 – 10, 2013 at Hudson River Valley Art Workshops. Mary Alice is always a pleasure to have as an instructor and guest. She was the director of the Kanuga Watercolor Workshops for 17 years, so she is definitely experienced in creating a great workshop experience for her students. 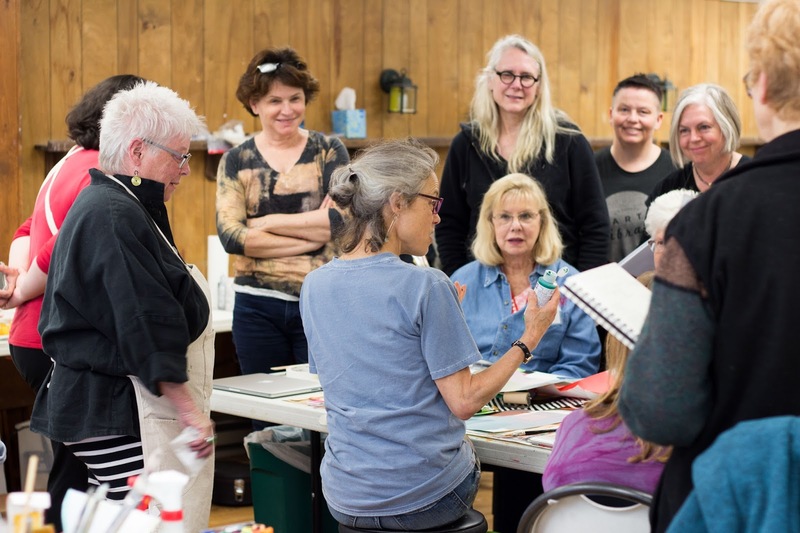 To facilitate that experimentation, Mary Alice, though her connections with various art supply producers, brings to her classes lots of the latest water media materials to play with in the workshop. We always know that Mary Alice is due arrive soon when we start getting boxes and boxes of art supplies arriving by UPS! Visit Mary Alice Braukman’s website for more information about Mary Alice. Eric Weigardt, AWS-DF, NWS, will be teaching a 3-day workshop for us for a change from his usual 5-day (which he’ll be teaching next year). So this is the chance for anyone who can’t get away for a 5-day workshop to enjoy Eric’s friendly, humorous, and knowledgable teaching style. The workshop is scheduled for May 17, 18, and 19th. Last year Eric received the highest national honor for a watercolor artist, the prestigious American Watercolor Society’s Gold Medal of Honor, April 20th 2012 in New York City. In American Watercolor Society’s (AWS) 130 year history, only 64 Artists have received this award since its inception in 1948. Check out Eric’s website for more about Eric’s many achievements and his books and DVDs. Paul George, the award winning New England artist, is teaching a 3-day workshop May 31, Jun. 1, and 2. Paul is signature member of the National Watercolor Society and is also an active member of the New England Watercolor Society, Cape Cod AA, North Shore AA and former Vice President of the Rockport Art Association. This is from Paul’s 2011 workshop with us. Looks like a very happy crowd! Paul has a great YouTube video in which he talks about the watercolor supplies that he uses. While we always post pictures from our workshops, I’m looking suggestions and ideas for more blog posts. What are you interested in reading or seeing on our blog? Would you like interviews with the instructors, the students?? More of the meal recipes? How about interviews with art material suppliers? 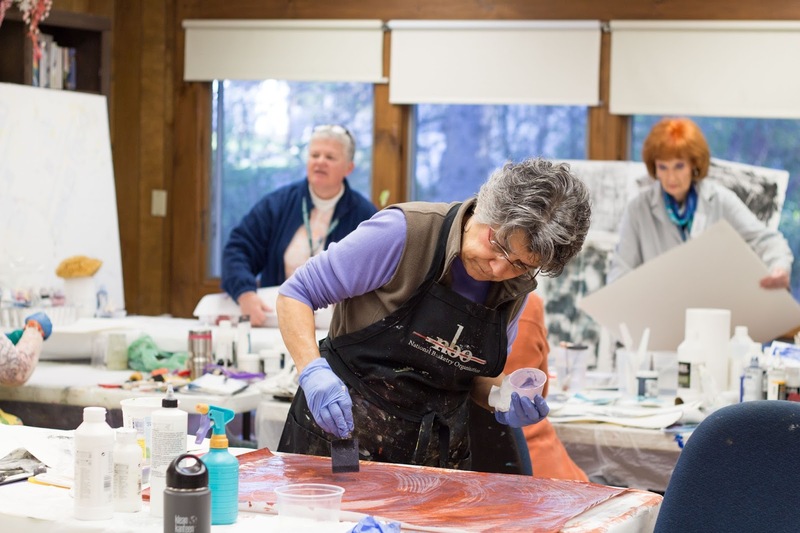 Karen Rosasco was here last week to teach her 5-day watermedia workshop. By the end of the week everyone was exhausted from the intense workshop, but oh so happy. Several people exclaimed that they had never laughed so long and so loud in their life! Karen was described as an excellent instructor who was challenging, but extremely encouraging. She knows how to approach and guide each student no matter what their level of experience is. The party atmosphere was in the classroom . . .
. . . and at the dinner table. Several of the students even suggested that maybe we could convince Karen to do a 7 or 10 day workshop in the future. No one wanted to go home, they were having such a good time. The class also put together a lovely collage card thanking us for hosting this fabulous workshop. We really appreciate knowing that people had a fabulous time at the workshop and at the inn. If you don’t want to miss the party next year, remember to sign up early for Karen’s workshop. It is scheduled for July 7 – 13, 2013. Gerald Brommer was here last week teaching a workshop on some fun methods for surface treatments. This was a new workshop that he developed and the full class and long waiting list was a testament to the excitement that everyone felt about getting into this workshop. Jerry started each day with a demonstration of new possibilities. Then spent most of the day going around the room offering one-on-one guidance to the students. Some really interesting and texturized surfaces were created! On the final days Jerry showed the students how to use these textured surface as the base for a watermedia painting. Here are the painting results from a couple students. If you missed your change to take a workshop with Gerald Brommer this year, don’t worry, he’ll be back here again in 2013!